The past couple of days have not been fun. Yesterday, I had a follow up appointment at DOU (Day Obstetric Unit) to be hooked up to the Dynamap machine which would take my blood pressure at regular intervals (every 5 minutes in my case). I have had so many problems with blood pressure throughout both my pregnancies that I feel like a bit of an expert! I know that a diastolic (bottom) number of 90 or above is high. All six of my readings came back between 92 and 96 so obviously, I worried. My urine came back clear of protein and after a doctors check, they didn't think that pre-eclampsia was coming back. The diastolic number at my booking appointment was 84 so because it wasn't a huge jump, they just think I had slightly high blood pressure to begin with. I, therefore, don't meet the threshold for them to medicate me and try to reduce my blood pressure, I just need an eye kept on me and was told to come back the following day (today). My iron levels were also deemed too low so I needed a Monofer infusion the following day (again, today). I arrived at 9.30am and I knew I'd be there til at least lunchtime. The midwives were all so lovely and I had my blood pressure checked first and a quick listen into the baby's heartbeat. My blood pressure came back with the diastolic number at 85 which I was really surprised about seeing as it was a bit higher only yesterday. The baby was absolutely fine too. I had a cannula fitted (I'd forgotten how much I hated that!) and saline dripped through. I was then given 900mg of Monofer intravenously. This seemed to take forever and the hospital doesn't have wifi - nightmare! They did feed me tea and toast though so that kept me happy for a while! 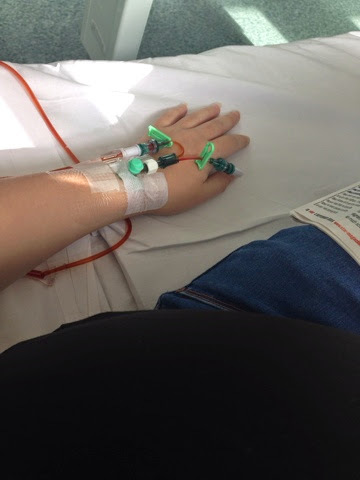 Once the Monofer drip had finished, I just needed another quick saline one to ensure that I got all the remnants of iron then I needed to stay a further half an hour just to make sure I didn't have a reaction or anything but all was good. I did feel a bit dizzy and lightheaded once I stood up though. I've been advised to go to Admissions if I feel a bit odd or ill but I'm back to the hospital again tomorrow to see my consultant so I'm sure I'll be fine until then. At this rate I'm gonna be sick of looking at hospitals! On the plus side, my iron levels should start to creep up but it isn't a quick fix. I don't need to take my iron tablets for a week, thankfully, then when I start them again I'll only need one a day!